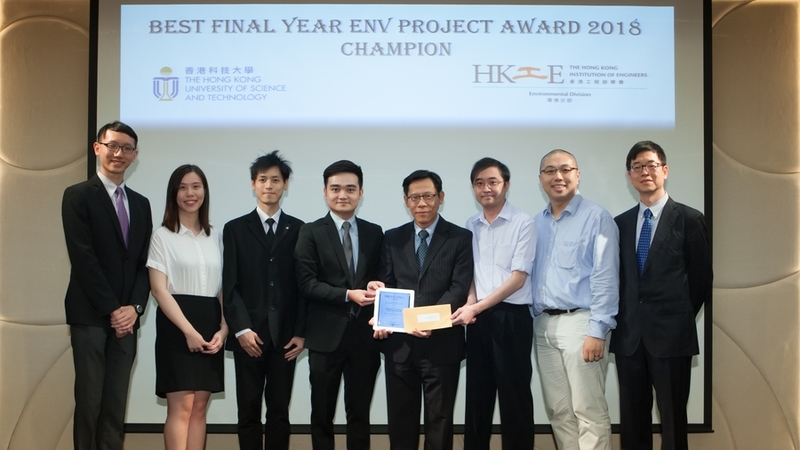 CSE student Dustin LEE, CBE students Ka Yi FUNG and Ho Long Barry LEE and CPEG student Ming Kit FOK won the Champion Award in the HKIE Environmental Division Prize for Best Final Year Environmental Project 2017/2018 with their FYP project titled Autonomous Domestic Water Purification System with Mobile Application. The competition was organized by the Hong Kong Institute of engineers as means to encourage widespread emergence of environmentally sound projects ranging from environmental pollution control to sustainable development. Their FYP project, co-supervised by CSE faculty Dr. Desmond TSOI and and CBE faculty Dr. Leung Yuk Frank LAM, aims at designing and constructing a control system for the water purification unit to produce potable water using professional and intuitive user interface. The project has previously won the Gold Award of the HKUST President's Cup 2018, and the second runner up of YPEC Undergraduate Section 2018. Congratulations again to Barry, Dustin, Ka Yi and Ming Kit!